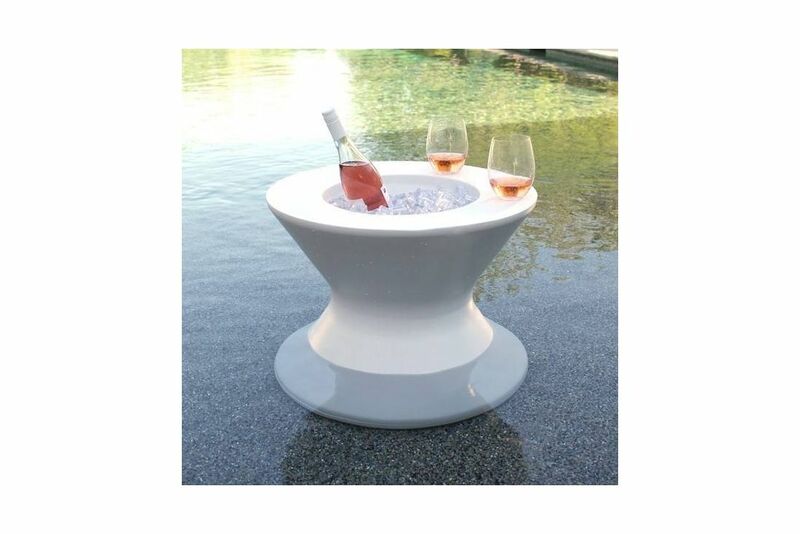 22-Inch Side Table combines the functionality of the Ice Bin Side Table and the sleekness of the 14-Inch Side Table. The Table can hold up to 10 cans and has a removable lid. Create a shaded relaxation space on your ledge by pairing the 22-Inch Side Table with an umbrella. No umbrella sleeve? No problem. The 22-Inch Side Table serves as an umbrella base, or it can pair with a built-in umbrella sleeve for added stability. Designed for use on a ledge with water depths up to 15 inches or on a deck. These stylish pieces are made of high quality, UV16 rated resin, and Sunbrella marine grade fabrics, designed to withstand the sun, water and chemicals of any pool and outdoor environment. Available in 11 colors so you can relax In Water, In Style.